We are targeting EPS of about $3.44. via Apple Inc. AAPL Q3 2010 Earnings Call Transcript. That $18 billion figure is extraordinary. Consider that last year during the same quarter, the company received $12.2 billion, then the sales growth forecast is about 50%. Granted that even though Apple just achieved 61% sales growth last quarter, Apple management is unusually aggressive in underestimating. If this estimate proves correct, then at the end of the quarter (Oct 1) the trailing twelve months’ earnings per share will be $15.29. That is equivalent to P/E of 16.82 on the back of four quarters of earnings growth (47%, 86%, 75% and 73% respectively). The price/earnings excluding cash would be 13.4. Earnings Smackdown: The best and worst Apple analysts – Apple 2.0 – Fortune Tech. From the data above, it’s clear that although my accuracy on units and sales was pretty good, my EPS was too high. The reason for this was the lower margins for the iPad. It’s very likely that these margins will improve after the launch quarter (as they did for the iPhone). The third fiscal quarter is at an end and it’s time to estimate performance. Andy Zaky has kicked off earnings season with his detailed accounting of what could be a $63.5 billion year for Apple. I put forward below my estimates side-by-side with Zaky. I come in at $62.6b for the year, differing by just under $1b or 1.6%. His numbers are certainly within what I would consider a margin of error of mine. My estimate for iPhones this quarter are lower due to possible slowing of sales before the iPhone 4 launch. My Mac numbers are higher based on some early estimates of industry pick-up. 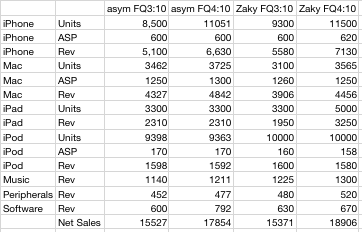 I concede that my FQ4:10 iPad estimates are low, but sticking with them for now. Apple Sells Three Million iPads in 80 Days – Yahoo! Finance. Looks like at least half two thirds three quarters of these guys have already blown it. For the record, in January I forecast 6 million units for calendar 2010 (and 10 million in first year). It looks like I’ll be facing the iPad dunce corner as well. The end of June will mark the third anniversary of the market release of the iPhone. When it arrived in June 2007, anticipation for the product was significant with high consumer awareness and expectations–though the 10 million/yr. target for 2008 was met with skepticism by many. The iPhone launched on June 29th 2007, with only a few days remaining in the quarter. 270k units were sold in that quarter and that was considered a solid start. When the company reported earnings a few weeks later (July 18th 2007) the company’s stock price jumped to $140 a share. As a sign of optimism in the company’s prospects, the P/E ratio showed that the company was expected to reach 35% growth (35 P/E). As iOS crosses 100 million units sold 3 years after the platform launched, it’s time to look forward to the next 100 million. My expectation is that well over 100 million iOS devices will sell during 2011, but even during the next 12 months (2H ’10 and 1H ’11) the total may well reach 100 million, making 200 million installed by June 2011 very likely. iPhone: Assuming only 50% growth (half of the average growth seen so far) gives 50 million units in the next 12 months. iPod: This is the most difficult to predict, but 46 million iPods will sell with a growth rate of -8% to -9%. If we consider the iPod touch part of the mix to be 40%, we get 19 million. The total with these assumptions would be 84 million. A slightly higher growth rate for the iPhone would easily push the total to 100 million. 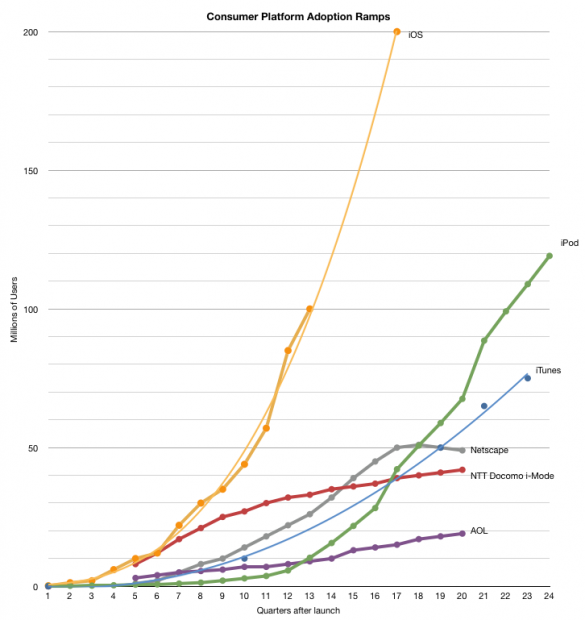 200 million devices in four years is quite a feat. Compare it to the growth of television which reached 50 million Americans in the first decade after commercial launch. Or consider the Netscape browser which only reached 50 million in its first four years or AOL which just crossed 20 million or in Japan where i-Mode reached 40 million users in the same time frame. At 200 million, the iOS platform will be 18% the size of the world-wide television audience. During the WWDC keynote Steve Jobs announced that “we will ship 10’s of millions of FaceTime devices in 2010”. Since only iPhone 4 currently runs FaceTime(*) then it stands to reason that there will be “10’s of millions” of iPhone 4 devices sold. And since the year is half over, it means we can divide “10’s of millions” over two quarters. That puts sales in the 10+ million range per quarter. My current forecast shows 11 million in Q3 and 13 million in Q4 corresponding to 50% y/y growth. Steve Jobs seems to be indicating this is well within reason. (*) one exception to this assumption is that he’s including a future iPod touch running FaceTime. This may very well be the case when the iPod line-up will be released probably in October. When Steve Jobs announced 150 million accounts with credit cards on the iTunes Store, iBookstore and App Store, he stated that as far as he knows it has “the most accounts of any store on the web”. 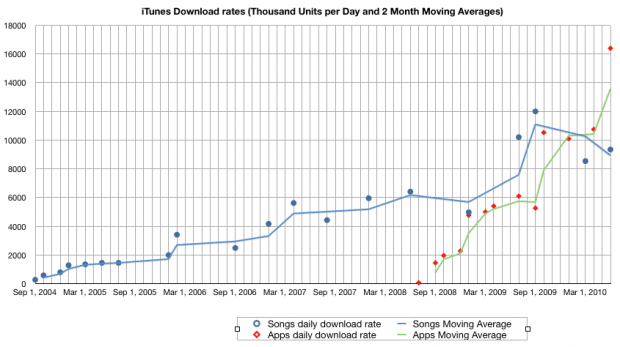 More interesting is the claim that iTunes has enjoyed 16 billion downloads. The last download data on iTunes was in February when Apple reported 10 billion songs downloaded. The new data implies the daily download rate is about 9.3 million per day. The forecast I had suggested 11.1 billion by June 1 so it’s come in a bit less than expected. 12 billion songs is expected in September. The graph that follows shows actual and forecast cumulative downloads for the App Store and iTunes store based on months after launch. 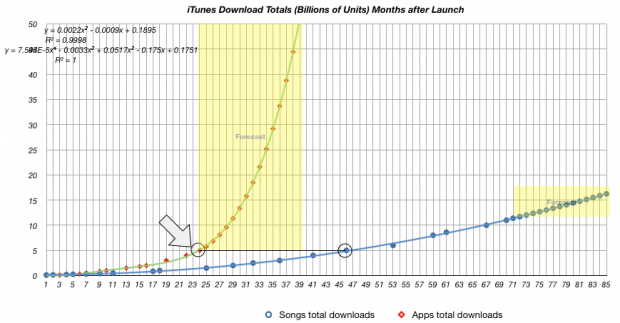 As it shows, 5 billion apps took 24 months whereas 5 billion songs took 46 months. This graph shows the download rates. The green line (apps) clearly overtakes the slowing blue line (songs/media). My expectation was 4.9 billion by June 1. Apple is about on target. Six months ago IDC predicted 300k apps before end of 2010. Here is a quick mid-year check: As of today there are around 215k available, with 250k likely approved by the end of WWDC. Apple’s WWDC banners proclaim 200k apps which was the last public count stated at the April iPhone OS 4.0 launch event. Looks like IDC’s forecast will not be a stretch especially as the new iPhone will create a new wave of apps. Also noteworthy is the nearly 10k iPad apps available in less than 3 months. The original iPhone reached 10k apps in about six months.